Finouche Alice by Sylvia Natterer is a ravishing 48cm tall vinyl brunette haired doll. She is suitable for play for children of age 3 and over but also very popular with collectors who understand the beauty and value of having a doll such as Alice. Brand Sylvia Natterer / Petitcollin Eye type Brown/ Painted Size 48cm/ 19" Hair Brown rooted Articulation 5 points Finouche Alice by Sylvia Natterer is a ravishing 48cm tall vinyl brunette haired doll. 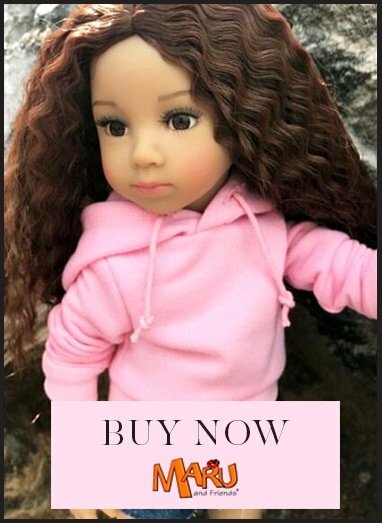 She is suitable for play for children of age 3 and over but also very popular with collectors who understand the beauty and value of having a doll such as Alice. Her face and eyes are painted in natural tones and she has a light sprinkling of freckles across her nose and cheeks. Her body is vinyl and she has articulation at the shoulders, hips and neck. She has a lovely ability to stand and find poses which makes her wonderful for play and enjoyment. The Finouche body is modelled on a typical 7-9 year old girl. Finouche's real looking hair rooted hair, is durable enough for washing, combing and styling. The My Doll Best Friend hairbrush is excellent for detangling without damaging the hair. Extra clothes are available to fit Finouche.